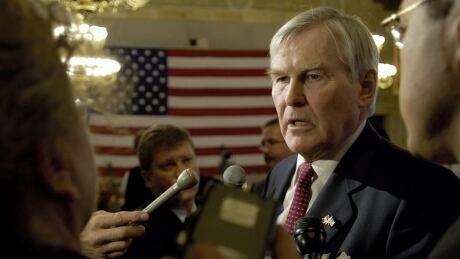 Michael Wilson, a former politician, diplomat and longtime mental health advocate, has died at 81. The University of Toronto, where Wilson served as chancellor from 2012 to 2018, confirmed his death in a post on its website Sunday evening. The school's president, Meric Gertler, calls Wilson a "great Canadian" who improved many lives through his "comprehensive excellence, his unassuming generosity and his quiet compassion." Wilson served for over a decade as the MP for the Toronto-area riding of Etobicoke Centre, including time as finance minister and minister of international trade under then prime minister Brian Mulroney. From March 2006 until October 2009, he served as Canada's ambassador to the United States. After losing his son Cameron to suicide in 1995, Wilson became a passionate advocate for mental health, and often spoke about the need for access to care.